GekaKonus® is a well-established trade name in the business of industrial process heating. 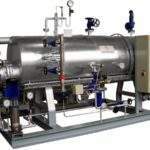 GekaKonus manufactures thermal oil heaters, high-pressure steam boilers and accessories. We also offer project management and engineering for process heating plants, commissioning, training, service and spare parts. GekaKonus’ expertise lies in the engineering, design, delivery and service of plants, components and apparatus for hot-gas and heat-energy generation and recovery, using thermal oil and steam as a heat transfer medium. 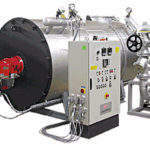 NUK-HP steam boilers are high-pressure steam systems with natural circulation for process heating plants. 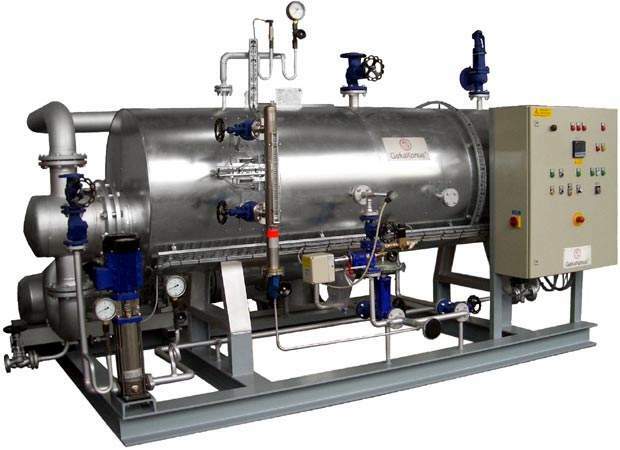 The NUK-HP is a high-pressure natural circulation boiler operating by the gravity circulation principle. Therefore circulating pumps are not required to operate the NUK-HP. Boiler water is used as the heat carrier. The water is evaporated in this boiler within a hermetically sealed circuit. The steam flows to the heat exchanger and the condensate flows by gravity back to the boiler. 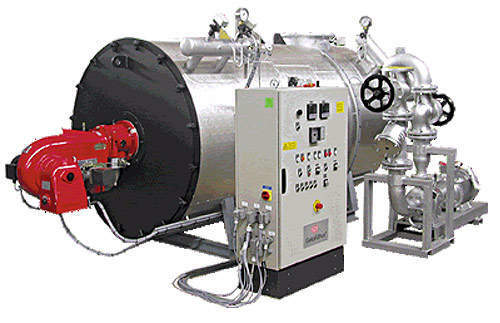 The process produces a very efficient, non-toxic processing heating system. 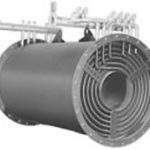 The low flow resistance in the vertical evaporator pipes guarantees high water circulating rates. Low radiation load in the combustion chamber and a large convection-heating surface means steam-bubble formation in the pipe system is very low. Controlled heat transmission at the heating surfaces is guaranteed and high combustion efficiency is achieved. The NUK-HP is suitable for the food industry for distillation and fractioning of fatty acids, esterification of fatty acids, distillation of glycerine, deoderising edible oil and fat splitting. It is also applicable in all process heating plants in which a natural circulation can be implemented in the heating system. 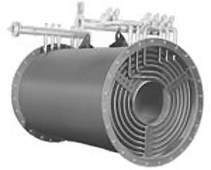 The GekaKonus THERMOMAT is a forced-circulation heater of three-pass design for organic, high-temperature heat-transfer media on mineral or synthetic basis. 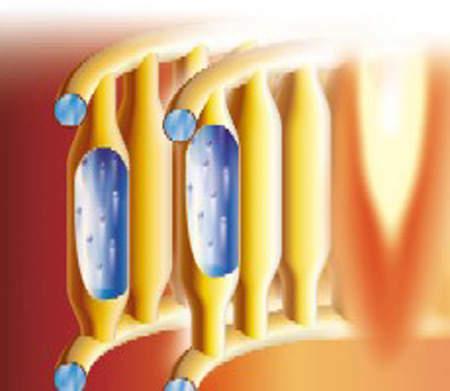 It consists of a cylindrical combustion chamber, formed by closely bended pipes. This principle ensures that a defined heat transfer is achieved at any point of the heating surface. 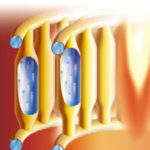 Forced circulation, and thus the flowing speed, is ensured by measuring and monitoring the volume flow. The GekaKonus THERMOMAT operates pressure-free with a temperature range of up to 340°C. At a temperature range of >340°C to 400°C it is necessary to consider a system pressure of up to 12bar. The GekaKonus THERMOMAT is operated with the customary heat carriers, which do not cause any corrosion – either in the heater or in the pipeline system. Nitrogen can be used to keep the heating installation stable, durable and fully operational over a period of many years. 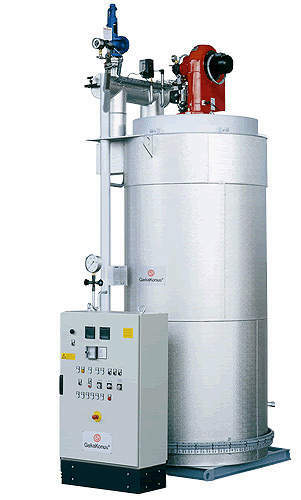 The GekaKonus exhaust-gas thermal oil heater economically utilizes exhaust gases. It is equipped and produced in conformity with European Community technical rules (PED 97/ 23/ EG) and DIN 4754, and other world-wide accepted organisations (e.g. SQLO, GOST-R). 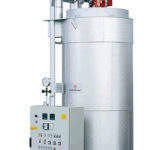 The GekaKonus steam generator is a secondary-heated steam generator. Thermal oil is used as heating medium. For operation there has to be used, treated water accumulation to feed water the steam boilers. The range of capacity is up to 25t/h of steam output and working pressure of up to 20bar. The capacity range and technical equipment vary according to the technical requirements of the customer.